We've been packing on the Christmas cheer lately, beginning with a great visit with Grammie Maureen and aunt Teresa last weekend. I somehow didn't take any photos, but we decorated our Christmas tree, finished up a 1000 piece Christmas puzzle (thanks, Colleen!) and eagerly began our Playmobile advent calendar. This weekend we hit up an annual Christmas party and candy cane hunt at a friends house, made graham cracker gingerbread houses and played more games than I can count of 'pretend to sleep while Santa comes and brings you a gift'! Yes, it's that time of year once again when the house is fully decorated, the baking has begun and we are very well refreshed on the lyrics to Rudolph. In non-Christmas news, the boys (and the Joes) are all doing great. The Joe's now have an imaginary friend of their own, conveniently named Joey! Odin hilariously began playing a game called 'Privacy Truck' where he takes his favourite transport truck and offers to bring 'privacy' to anyone who needs it! He'll say, "Mom, do you need some privacy? If you do, I'll come right over with the privacy truck!" Ha! The only thing Odin wants for Christmas is a skid steer. I honestly had no idea what a skid steer was until this summer when we were walking past a construction site near our house. They are renovating the old high school into 40 condo units, and Odin and his daycare class have been watching the progress very closely. One of the 'worker men' drives a skid steer and Odin thinks it's the coolest of all the incredibly cool construction vehicles out there. Here's hoping Santa knows what a skid steer is, too! Cale is hoping for a Lego NinjaGo set, a skate board, and some music stuff. He very recently started asking Alan for guitar lessons and he's got a couple of chords down to go along with his drum beats and piano skills. I love that we have never had to ask him to practice, he just seems to truly love it. He learns piano songs completely on his own (from the demos on his keyboard), and sings and drums the days away. It's so sweet. 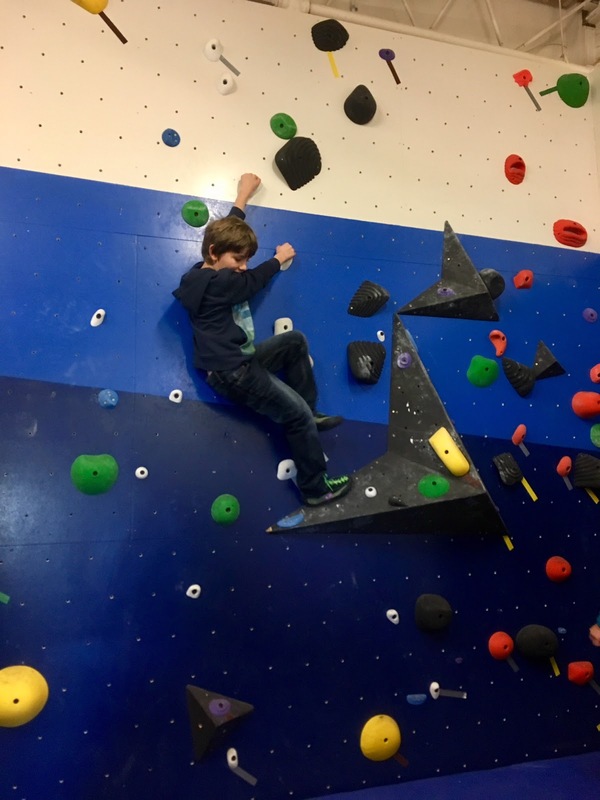 Caleb has also fallen in love with our brand new community climbing wall - we are so lucky to have this wonderful facility also located in the newly renovated condo building. They are offering kids nights, ladies nights and open community nights, so we are hoping to get there a lot over the winter. Happy Holidays, everyone! I'll update again before and after the big day! Please tell Odin that I could use a load of privacy, if he makes deliveries! See you soon!